The musical and cultural legacy of Prince is such that the tributes to the musician, who passed away in April at the age of 57, are unlikely to taper off soon. Neo-soul innovator D'Angelo will be part of the Prince tribute on the BET Awards this Sunday, June 26. Rolling Stone reports that The Roots, Janelle Monae, and former Prince protégé Sheila E. will be among the other artists participating in the performance, though the network isn't ruling out a few surprises. And after the shade BET threw on Twitter at the Grammys' Madonnna-led number honoring the industry's fallen hero, the pressure is on this tribute to deliver. (In a tweet that's since been deleted, BET joked, "Yeah, we saw that. Don't worry, we got you.") There's definitely a very clear musical through-line from Prince's catalog to D'Angelo's. Is that the main reason the singer was chosen to anchor the BET Awards tribute? Or were Prince and D'Angelo friends? I was five years old. “I Wanna Be Your Lover” had come out, and it was a big hit. When that album came out, it was just huge. He really, literally, was the talk of the town. Everybody was wondering, “Who is this guy? Is he a guy? Is it a girl?” No one really knew who it was. I remember we had the album, and my brothers were just enamored by this guy. They told me, “He plays everything, he writes everything, he’s singing everything”, so I was hooked from then on. I learned how to play every song on that album, note for note, at five years old. So D'Angelo was already practicing his Princely falsetto at the precious age of five. The connections between the two artists don't stop there. According to Rolling Stone, Prince's long-time friend and former tour manager Alan Leeds also managed D'Angelo. Leeds remembered Prince once reaching out to him about his up-and-coming R&B artists. There were even tentative talks about D'Angelo opening for Prince on tour to promote D'Angelo's album Black Messiah that sadly never came to fruition. "He would come to Maxwell's shows or D'Angelo shows or stuff that I was doing," Leeds recalled to Rolling Stone about Prince. It's probable that D'Angelo and Prince met during that time. Last year, Prince praised D'Angelo in an interview with Ebony about his discography's addition to Jay Z's streaming music service, Tidal. He told the magazine that it was his call to feature his own influences on his page, rather "Related" pages, i.e. younger artists who carry hallmarks of Prince's sound. "I love D’Angelo," Prince said, "but he’s just getting started." It's unclear how well Prince and D'Angelo knew each other personally. But in the aftermath of Prince's death, D'Angelo delivered one of the most affecting musical responses. He appeared on The Tonight Show on Tuesday, April 26 and performed a cover of the Prince ballad, "Sometimes It Snows In April." 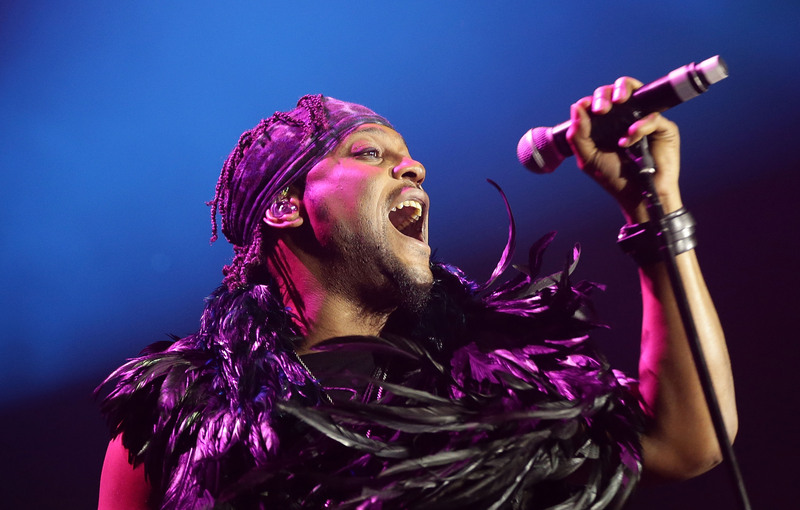 Backed by Maya Rudolph and Gretchen Lieberum (who are both in a tribute band called Princess), a tearful D'Angelo changed the lyrics of the song to include, "I often dream of heaven and I know that Prince is there."